The former church at Santiam and Main, in a shot from Dec. 19, 2016. 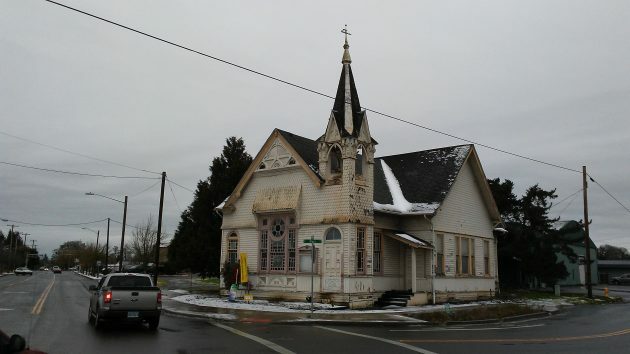 Albany Mayor Sharon Konopa has an idea for the historic Cumberland Presbyterian Church: Move it away from the corner of Santiam Road and Main Street, where it was built in 1892. There’s another Albany building the mayor would like to change addresses. She thinks the post office should find another home, away from the city block across First Avenue from the new Albany Carousel. She’s sure that once the carousel is finished and operating, the post office would like to be somewhere else. For the old church, which the city bought for a street project in 2000 for $150,000 but has since declared surplus, Konopa says one possible new site is city-owned property near the Albany Skate Park off Santiam Road. She’s also thinking of another place but needs to check on it further before talking about it in public. The public works department had planned this month to issue a request for proposals from people interested in taking the old church off the city’s hands. But Chris Bailey, director of public works operations, said preparation of the request had been pushed back to February, and the mayor’s plan now adds a new wrinkle. As for the post office, the mayor says she’d like to identify other sites before approaching the Postal Service. But she thinks one good spot would be the long-vacant former Safeway store at Calapooia Street and Pacific Boulevard. She had heard a rumor that the building, where roofing repairs were done in 2016, might find a use as a fitness center. But a post office would be of greater use to the general public, because of the ample parking if nothing else. Parking at the post office is often cramped, especially now that streets around it have been torn up. Why are folks so fascinated with this old church. Knock it down. Albany needs another Starbucks. I love that Church and would love to have the funds to move it and have Ron Haines Construction remodel it for me … into a private home … love the ideas the Mayor has propsed … now off to play the lottery so I can move forward on my Church dreams !!! Let’s leave it to private enterprise (and the amply-budgeted federal government) to decide what to do with these properties. Our property tax bills are high enough as it is. Amen! If she wants the church moved, she can pay to do it. The Post office had another building on Ferry and let it stand empty! STOP WASTING MY TAX DOLLARS. I like the idea of using the old safeway for both a PO and Gym, exercise and mail your packages, good idea, plenty of parking, which is lacking now. I do like to preserve old buildings, so not sure about the church building. Make it the museum instead of the downtown one?? It strikes this Hering Fanboy that were the Council to pay for the moving of This Old Church for reasons tangential to preservation thereof, the Council will have crossed that pesky, old constitutional separation of church and state line The Founding Fathers were rather insistent on this issue and everybody loves those guys. There is a secular solution to the Council’s challenge, but it won’t come cheap. (These things rarely do). The Council could authorize the collection and preservation of These Old Churches from all possible denominations, avoiding the appearance of any official link between the City and a particular religious practice. One can imagine a whole new downtown Tour of Churches, culminating in a ride on the Carousel. The irony is simply delicious. But the cash flow to the City will likely surpass even the 3% city sales tax on recreational cannabis. A bonanza! The downside? An entire new City Department budgeted fully for what is certain to be an expensive maintenance regimen. New layers of management, middle-management, management assistants and subalterns. It might be a whole lot less troublesome to sell This Old Church, with the caveat that the building must be off the property by some date certain. The Constitutional issues raised by not razing the church are more trouble than This Old Church is worth. If it’s not currently being used as a church it’s just a historic building, no conflict. I hope that someone can restore this beautiful old piece of history. It is simply gorgeous. What a shame it would be to tear this down! Moving it would be great as long as it is preserved. Why don’t they move into the PO building on Ferry St??? It was built by the USPS years ago and then vacated! It is listed for sale! All that money wasted to build a new building and it is just sitting there empty and the downtown location being squeezed out! I’m sure has everything the downtown location has plus it is way newer.